DP Autos has established itself as a vehicle repair garage with an extremely good reputation through high levels of repeat business and word of mouth throughout the Rotherham and Sheffield area. Darren Pugh has in excess of 25 years experience working with many main dealers throughout Yorkshire and the North Midlands. 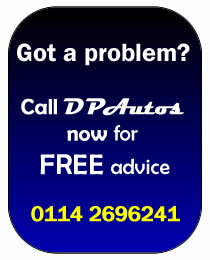 It's because of this wealth of experience why DPAutos can provide a high level of service on all makes and models. Darren and his team are only too happy to assist motorists who may be seeking expert advice about any kind of issues they have, or require any kind of service from a Professional, friendly and highly reliable company. We are located in Handsworth, Sheffield on the outskirts of Rotherham just two minutes away from the Sheffield Parkway (A630). CONTACT US TODAY TO FIND OUT MORE DETAILS OR TO DISCUSS YOUR REQUIREMENTS ON 01142696241.